Greet the beautiful City of Lakes to begin your vacation. 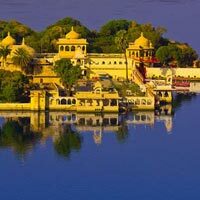 Launch your exclusive Rajasthan tourism package with a comfortable drive to the enchanting city of Udaipur. Upon arrival, check in to your hotel and freshen up for the exciting day ahead. 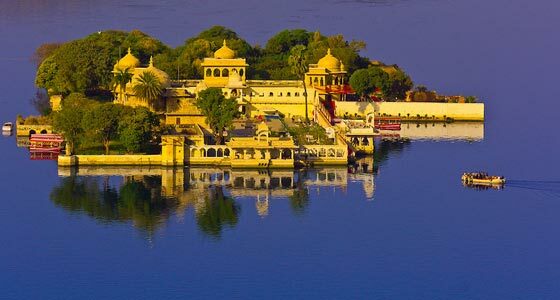 On the first day of your Rajasthan package, you will visit some of the major attractions of Rajasthan like the Lake Palace, Jagmandir Island, Vintage car museum and Shilpgram. After this, you will get a chance to take in the breathtaking sunset at the Monsoon Palace. Return to the hotel at night for an overnight stay. Enjoy a sumptuous breakfast before heading out for an incredible day of visiting other attractions of Udaipur as a part of your Rajasthan tour itinerary. Today you will visit the City Palace, Jagdish Temple and Bhartiya Lok Kala Mandir to marvel the contrasting culture and extraordinary history. Later, you will also be taken to the Pratap Memorial, an 18th-century monument which is perched on the top of Pearl Hill in Udaipur. End the day with a comfortable stay at the hotel. Explore the beauties of the only hill station Rajasthan. After a filling breakfast, checkout from your hotel to embark on the next leg of your Rajasthan holiday package. Enjoy a comfortable drive to Mount Abu and check in the hotel to relax and freshen up. Post lunch, visit the 11th century Dilwara Jain Temple which is famous for its extraordinary architecture and marvellous stone carvings. After marvelling at the amazing carvings, relax on your cruise through the Nakki Lake at Sunset. The scenic beauty on the cruise will surely take you to another world. Return to hotel for a comfortable overnight stay. Head home with beautiful memories from this Rajasthan package tour. As per your Rajasthan tour itinerary, end your magical vacation with a hearty breakfast at the hotel. Drive back home with fond memories of magnificence and splendour.